When I got her email, I was feeling overwhelmed by fear. You only have to pop on the news at any given time to see why, and if you’re like me, the national chaos is being mirrored in personal relationships. It's like all our collective muck is rising to the surface. Her email brought me back, though, reminding me that we must battle our own demons first. p.s. 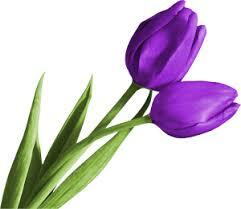 I just dyed my hair purple like the tulip above, and we're going to be a feline foster family here at Chez Lourey. Self-care, kittens, and whimsy, folks! That's what the world needs now.